Yesterday we explored the motions of the heavens on this 5-Sun Earth: how the Suns move across the sky and when night falls (not too often, it turns out). Today we are going to be the party pooper. We are going to take a look at how a system like this could come about, and whether it makes any sense. First off, is this system realistic? Well, sort of. The properties of the stars are all realistic, and the orbital configuration of the system is stable. But we have not yet told the story of how such a system could come to be. Given that stars evolve, could this system really exist? The short answer is: no, this system probably cannot exist. Stars evolve too fast and at different rates. It’s those red giant and supergiant stars that are the problem. Let me explain. Giant stars are like teenagers: they are not born that way. And they don’t stay that way for too long (luckily). The life cycles of different types of stars. It is important to realize that 1) None of these images is to scale, it’s just a cartoon; and 2) massive stars evolve much more quickly than average ones. Credit: here. Stars follow one of two different evolutionary tracks. Almost all stars are “average”, born less than 6 times as massive as the Sun. 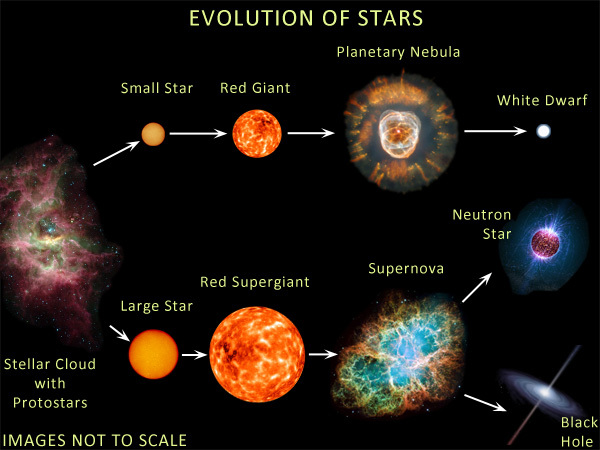 The image is misleading because average and massive stars evolve at very different rates. Massive stars are like rock stars: they are rare, burn extremely bright, live fast and die young. Within ten to thirty million years massive stars’ lives are over. Their motto is: it’s better to burn out than to fade away. Average stars are like normal people: they take their time and generally make a lot less noise. The Sun is already 4.5 billion years old and will take at least 5 billion more years to become a white dwarf. Red dwarfs, the wimpiest stars, last trillions of years on the main sequence! Their motto is: Truckin’ played on an infinite loop. Since it evolved fastest, let’s start thinking about the red supergiant sitting 500 Astronomical Units away from the Tatooine binary. A red supergiant starts off as a main sequence OB star ten to twenty times more massive than the Sun. At this point the star is blue and very bright, almost as luminous as the red supergiant it will become. The OB star burns so quickly that it exhausts all of the hydrogen in its core within 5-20 million years of its birth. The star then starts fusing hydrogen in an outer shell, which puffs it up into a red supergiant, which is basically a humongo-star much larger than Earth’s orbit around the Sun. The star does not remain a red supergiant for very long, just a couple million years. Then it collapses and explodes as a supernova! Will our 5-Sun Earth be fried by this nearby supernova? Maybe. A supernova so close by would dump a titanic amount of energy on the planet. The most damaging radiation would come from high-energy light like UV and X-rays. Our planet’s atmosphere would certainly be affected: the ozone layer might be stripped. In the worst case scenario, the entire atmosphere might be lost to space. This would be bad news for life on land, but not for life in a global sense. Even if the continents were sterilized, ocean-based life would likely survive, as UV light is absorbed in just a few meters of water. Life on Earth took hundreds of millions of years to appear. This supernova happens so early — just 10-20 million years after the start of planet formation — that our Earth would not even have finished growing by this point! During the supernova, the former red supergiant loses about 90% of its mass. It goes from 10-20 times the Sun’s mass down to 1-2, the typical mass for neutron stars. That’s like going from Will Ferrell to a 1-year old. The star’s gravitational pull drops correspondingly. This affects the orbits of the stars in our system. It makes the orbits expand drastically. It would push our supergiant onto a much wider orbit. Given that the Sun was still in its birth cluster at the time, the former supergiant would probably be lost, left to roam the galaxy on its own. Supergiant recap: The supergiant started as a bright blue star, spent 1 million years as a red supergiant, then went supernova and was lost from the system. Now let’s turn our attention to the red giant binary, orbiting the Tatooine binary at a distance of 20 AU. Our red giants have a history. Think of them like two Steve Buscemis — we like them a lot but we know they’ve been around. All “average” stars become red giants at some point. The Sun will have had a full 10 billion years before going red giant (bad news for Earth but good news for astronomers around other stars looking for dusty white dwarfs; see here). Stars just five times more massive than the Sun go red giant in only a hundred million years, whereas stars that are ten times less massive than the Sun have to wait trillions of years to go red giant. Our 5-Sun system has a pair of red giants on a 20 AU orbit. Let’s rewind the clock on those stars. As red giants they are on the wimpy end of the red giant spectrum at only 20 times the Sun’s size. Since we don’t want to have to wait forever for those stars to go red giant, let’s make them yellow F5 stars with 1.4 times the Sun’s mass, which go red giant after a little more than 4 billion years. That’s about how old the Earth is, so it lines up nicely. For the first 4 billion years of their life, these stars were just a little larger than the Sun and only 2-3 times brighter. From the surface of the 5-Sun Earth they would have looked like circles (not points of light), but at least 10 times smaller than the Sun. On the way to becoming red giants these stars would have lost little mass. Their orbits would not have changed appreciably. What comes after the red giant phase is more dramatic. On the “asymptotic giant branch” these stars would be extremely bright, about 6000 times brighter than the Sun, which is 60 times brighter than we assumed they would be as red giants. Luckily, the stars would lose about half of their mass on their way to collapsing as white dwarfs. Their orbit around the Tatooine binary would expand dramatically, from 20 AU out to 50 to 100 AU. This would protect the 5-Sun Earth to some degree, although it might get pretty hot for a while! The red giants’ mutual orbit would also expand dramatically as the stars lost mass. Once their cores collapsed into white dwarfs these objects do nothing but cool off for eons. Red giant recap: The red giants in our binary started off as stars similar to the Sun. They expanded and became red giants with little change in their orbits. Then they brightened considerably, lost half their mass and their orbits expanded. On to the Tatooine binary, whose story is very short. Each star in the binary is somewhat fainter than the Sun. As such, these stars would not change much long after the red giant binary became a white dwarf binary. We can just think of them as staying the same. Now let’s put the pieces together to look at the evolution of the 5-Sun system. At the start the system contained five stars: the Tatooine binary, a binary of two Sun-like (F5) stars, and a distant OB star. Only two stars — the Tatooine binary — appear as Suns in the sky. The other stars are too small to qualify as Suns. About 10 million years later the OB star becomes a red supergiant. Just 2 million years later the red supergiant goes supernova. It loses most of its mass, causing its orbit to expand and the star to be lost from the system. After 4.3 billion years the binary stars become red giants and there were 4 Suns in the sky. When those stars become white dwarfs the system is back to just 2 Suns in the sky. That’s where it will stay. At different times in the lifetime of the system, the “5-Sun Earth” had 2, then 3, then 2, then 4, then 2 Suns in the sky (with a supernova thrown in). The system never reached the 5-Sun state. Of course, it’s not absolutely impossible that a system could reach the five Sun situation, but that would require that the stars in the system have different ages. This wraps up our story of the 5-Sun Earth. Hope you have enjoyed it! March 24, 2016 in Playing God with planetary systems. Very interesting. Could multiple smaller stars have collided to create the red supergiant later in the systems evolution? Thanks for the article! It’s not impossible for the supergiant to have been captured or created later but it is extremely unlikely. The Redwards Traverse of the Sun takes about 2 billion years after the end of the Main Sequence at age 10 billion. Only once the Sun is about 12 billion years old will the Red Giant blossoming will really take off. It’ll balloon in just a few million years, doubling in size in roughly the last million, to about ~256 times its current size and about 2,730 times brighter. But then the Core will explode, blowing out the Red Giant in the so-called Helium Flash, which’ll dump the Sun onto the Helium Main Sequence. That lasts about 100 million years. As crazy as it seems to have a solar system with 5 suns, last night I looked up in the sky and saw one with 6 stars about 50 light years away. We call it Castor. Of course it all looked like a single point of light to my unaided eyes.